America SCORES is an innovative youth development program that combines creative and physical expression for “whole child” benefits. 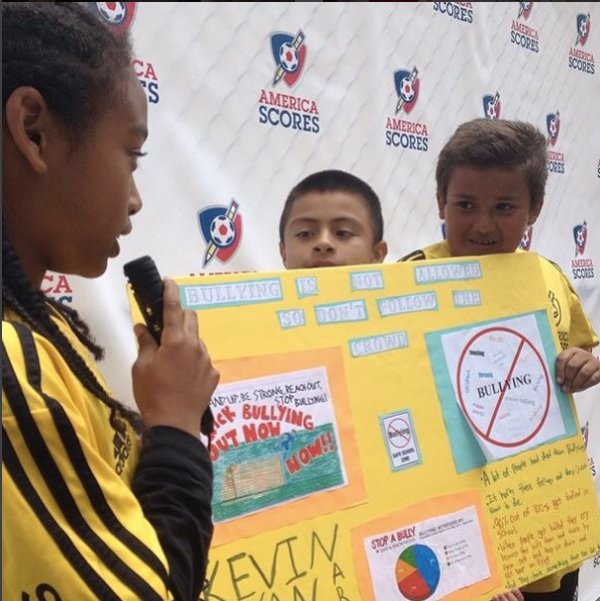 America SCORES is a time-tested, fast-growing afterschool program providing the triple play of poetry, soccer, and service learning programs to Bay Area public schools. Since 2001, SCORES has been delivering joyful learning opportunities to children, giving students the support, confidence, and vision to meet new challenges and chart their own futures. see our poet-athletes in action! The world's most fluid, beautiful game is at the heart of SCORES. Teamwork is at the core. Unleash the voice! Creative expression, word play, and public speaking allow students to discover their individual, entirely distinct voices, all while building critical literacy skills and self confidence. SCORES students learn how to make a positive, impactful contribution to their communities through a semester long service-learning curricula.